"There were times - especially on stages 3, 4 and 5 - where I was in the depths of a personal hell. Not exactly a pain cave, something different. I was desperately despondent and unhappy." My friend, Jenn Roberts, wrote this phrase in her race report about TransRockies, which she and another friend, Sierra, completed in the Women's Division. I first met Jenn in June 2007, during the 24 Hours of Light, while I was trying to pound out as many laps as possible with a bad knee and almost no training, because I had been injured for the past four months. Needless to say, riding solo in a 24-hour race was an abysmally bad idea, and by the 1 a.m. "twilight lap" - my 12th - I was struggling mightily. Jenn was taking photographs at the base of the short, steep descent into camp. Since even 12 times around the block hadn't given me enough confidence to ride it, especially while I was being observed, I stepped off my bike and walked toward her. "This lap is going to have to be my last," I said. "I don't want it to be, but my knee is locking up." Jenn shook her head. "I don't know how you do it," she said. "It's easy," I said. "You do one lap, and then you do another, and another. You just keep going until you can't." "Well, I did one lap and that was enough for me," she said. Jenn was riding the race in with a team of eight women. "You're not going to ride any more?" I asked. "If they need me in the morning, I might," she said. "But I'm really more of a one-lap kind of person." Jenn lives in Whitehorse, Yukon, and I only see her once or twice a year. So I don't know what her journey has been like during the past three years, but it landed her at once of the more difficult endurance mountain bike races in the world, TransRockies. Jenn was an inspiration to me during the past week, because every stage managed to throw out more and more challenges, and every night she was clearly at her limit of stress, fatigue and fear, but every morning, come rain, wind and bitter cold, she toed the starting line and started the suffer-fest anew. 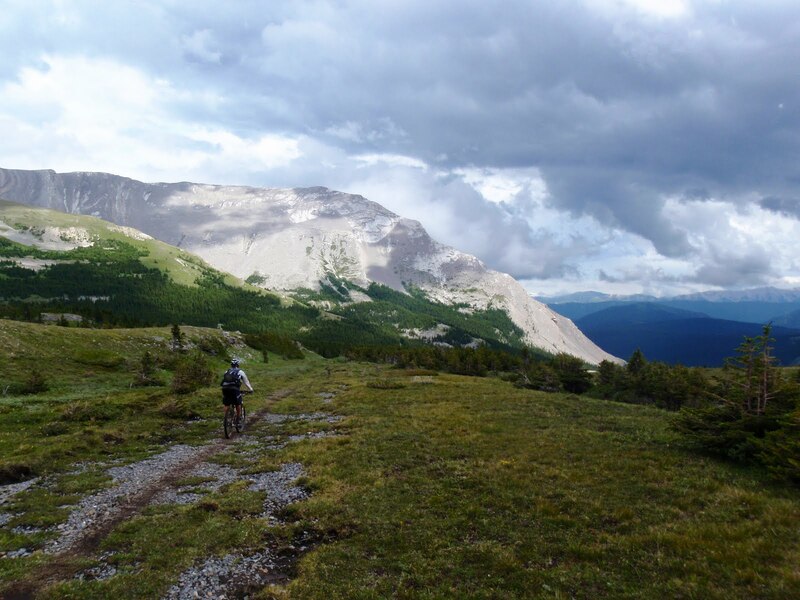 She went from a "one-lap kind of person" in 2007 to riding 400 kilometers and 39,000 vertical feet of muddy, rooty, rocky trails in TransRockies 2010. And in her transformative journey, I can't help but see reflections of my own. I'm sure there were innumerable times during the week when Jenn asked herself the question, "What in the #$%& am I doing here?" It seems from her race report that even now, with the glow of finishing the race still fresh, she continues to wonder about that ever-present question - "Why?" "Why?" Personally, I have never been all that interested in getting on a podium. I'm sure I would enjoy it were I ever to achieve it, but instead I continue to seek out races that are way over my head and glean satisfaction from simply surviving them. It would be logical for me to choose shorter, more surmountable goals, then work on my speed, work on my skills, perfect my strategy and finish knowing I did the very best I could do. But that whole approach seems so mechanical to me; not that there's anything wrong with it, but it's just not who I am. I view my cycling not as mechanics, but as art. I don't want an instruction manual. I want a blank canvas, as white and wide as the summer sky, that I can imprint with my joy and sorrow, and color with my blood, sweat and tears. Then, long after the race is over, and long after the race results have been relegated to the deepest regions of the Internet and the instruction manual has been rewritten, the experience is still permanently rendered in my heart with abstract shapes of knowledge and beauty. "Why?" It's easy for me to say I race for fun, but I don't. Yes, I do think biking is fantastically fun. But if I was purely interested in fun, I would spend my holidays on fair-weather joy rides, taking in front-country scenery and sipping cold drinks on a beach. 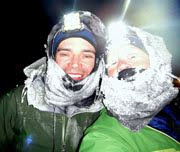 Instead, I take the hard way into the back-country, purposefully experiencing a wide range of discomfort along the way. I could say I do this for my health, but battering my muscles and bones amid physical extremes, not sleeping and stuffing my craw with refined sugars isn't doing my body any favors. I could say I race for personal challenge, but that's not entirely true either. Trying to build a bicycle or learning Spanish would be challenging for me, but I don't spend my time immersed in challenges that are actually useful. Instead, I go out and destroy bicycles, and grind my body into the dust, and cry out in pain and frustration and get back on the bicycle and do it again. I pay a lot of money to do this. I allot a large chunk of free time and vacation to this. All because of these beautiful works of art. These works only I can see. These works that I can never forget. And I cherish the hard moments, the moments of despondency and unhappiness. I cherish these moments because they're so intense and real, like bold, red brush strokes through a life of placid beige. And then, when the placid beige gets me down, as it sometimes does, I close my eyes and see the flickering green aurora that filled the sky the night I bonked on the Iditarod Trail ... the night I was so scared and weak that no movement before or since has been as difficult ... the night I was so overwhelmed and uncertain that I wasn't entirely sure I would live. And the green waves of northern lights were so bright that they still reflect warmth and joy in my heart, two and a half years later. "Why?" I want to take the image of something impossible to me and make it real, make it possible, just for the sake of creation. In that, I feel a glimmer of what it's like to fully live. "It was hard - as I knew it would be - but what was hard about it wasn't what I expected. And I suppose that's a good thing. It's almost enough to make me want to try it again. Which is crazy." "I want to take the image of something impossible to me and make it real, make it possible, just for the sake of creation. In that, I feel a glimmer of what it's like to fully live." I love that line - so true for endurance events and all the crazy stuff we do. I love how you say, it isn't really for getting on the podium, or fun, or health, or challenge, or personal challenge...that it is really hard to describe the why...although in those few lines you do it beautifully. I just finished the Colorado Trail race and spent a good amount of time pondering the 'Why' of it, both while I was out there, and afterward while the whole experience was setting in. You summed it up so well. Thank you. Frequent reader/rarely comment......suffice it to say...congratulations. Huge congratulations on the Colorado Trail Race. I just read your race report yesterday and it was your and Jenn's writing that sparked this blog post. That was one of the best blog posts you have posted in the 2+ years I have been following you. Very profound - Why? Great question that many ponder and hopefully never answer because once the answer is found I believe the drive will be lost! Everyone else here as already said, but that truly was a beautifully post. I totally agree with Bill G's comments. "As you may have noticed, you are not actually the only one who can appreciate these works of art. Thank you for letting us in on them, too. Val"
Seriously. Thanks for sharing the thrill, pain, insight, & life, Jill. And you do so ... so eloquently, which such clear focus. I really enjoyed this post. Very well said. Posts like this, Jill, are one of the many reasons why I follow along on your travails. You can put into words what most of us cannot! Thank you. What comes to mind when I read this is the quote that is something like "you have to experience the hardest times in life to appreciate the greatest joys". Congrats on finishing. As always you are one tough cookie! Great post, Jill. I think Lisa is right too - contrast and extremes help us to appreciate the depths of human experience. I like thinking about the "whys" of all this. There is great truth in what you have written here. Jill thanks for putting into words what I believe many of us seeking adventure feel but can not articulate. Excellent post. beautiful piece of writing Jill! I wonder if you would be willing for me to post excerpts of it to my readers on www.alastairhumphreys.com ? Of course! Thanks for commenting.